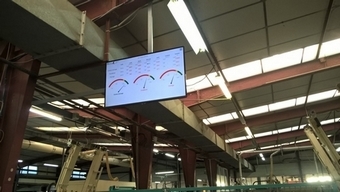 Because communication is the key to success of continuous improvement plans and because it is difficult to ensure that real-time communication , we packaged a simple solution to the workshop display. The indicators and messages can have different forms : literal, graphic, icon, … for a successful visual management. Make your SIM easier with Aquiweb MES software ! Now flash dashboards are digital, data is easily and objectively updated in real time. 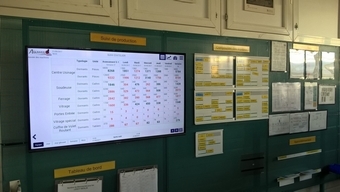 >> More information about visual management. We offer a complete package (equipment, software, configuration) based on full web technology. The Box Aquitime is a simple, standard and economic solution. The following links allow you to discover case studies with full explanations and videos.